As a former pet groomer, I have cleaned lots of dog ears. Unfortunately I sometimes came across dogs with ear infections. Sometimes the owners were clueless about ear infections and/or how to clean their dogs’ ears in between grooming appointments. Many times they knew they were supposed to clean them, but had no idea how to do it. 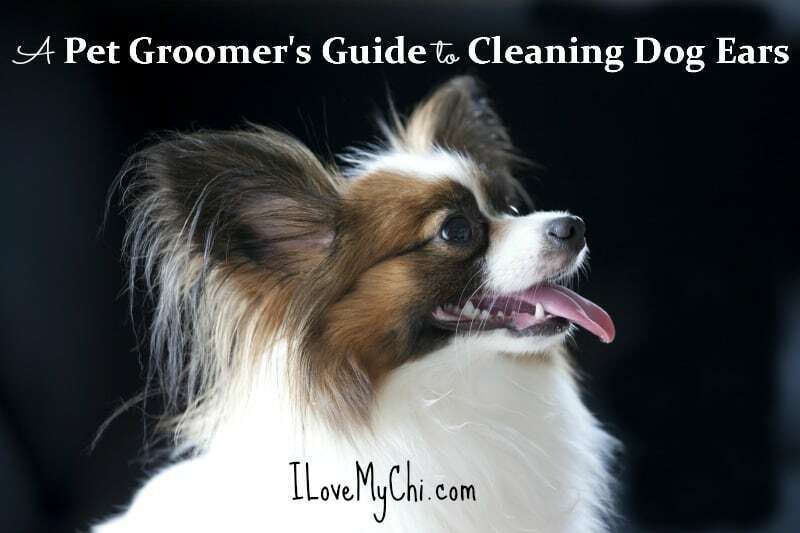 You can always get your vet to show you how to do it, if you need personal instruction, but I thought it would be a great idea to write an article on how to clean dog ears properly. 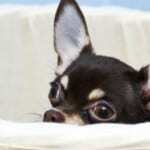 We, as Chihuahua owners are lucky, as our little dogs aren’t really prone to ear infections. Dogs with big floppy ears tend to get infections more often. 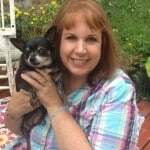 But that doesn’t mean chihuahuas can’t get infections though. They can and do sometimes. And their ears do need periodically cleaning. If you have a dog with floppy ears, or one with allergies or a dog that is prone to ear infections, clean once a week. Any more than that can upset the natural PH balance in your dog’s ears. If the dog has an ear infection, your vet may instruct you to clean more often, so do clean according to your veterinarian’s instructions. 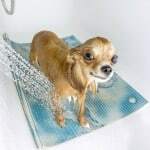 For most chihuahuas, cleaning the ears every other week is often enough. Ear Cleaner Solution You can get a medicated solution from your vet if needed. 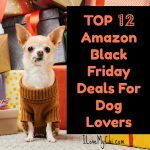 You can also buy ear cleaner solutions from any pet store, or Amazon. Or you can make your own natural solution of 1 part water and 1 part vinegar. Use white vinegar unless your dog is prone to infections, then use apple cider vinegar with the “mother”. We use Braggs. Gauze or Cotton Balls Either will work. Rubbing Alcohol Alcohol is too strong for the sensitive ear tissue. It can be painful and can also dry out your dog’s ears and actually cause an infection. Cotton Swabs More commonly known as Q tips, these can cause damage to the ear drum. Hydrogen Peroxide This is also too strong for your dog’s ears and unless told otherwise by your vet, never use it. Be sure to read all about dog ear infections! Squirt a few drops of cleaning solution onto a cotton ball or gauze pad. Make sure you get plenty of solution onto the ball or pad. 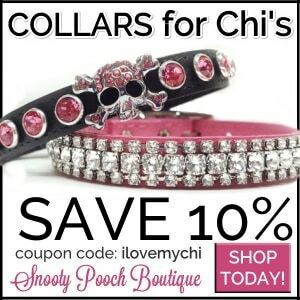 Pull the flap of your dog’s ear back. Wipe the inside of the ear canal and the inside of the flap of the ear with the solution. Get in there good but don’t go too deep. Close the flap over the ear. Massage the base of the ear for about 30 seconds. Let the dog shake their head. They will shake a lot of the solution and ear gunk out. Look into the ear again and wipe off any wax or gunk that is left. 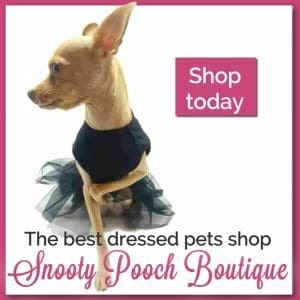 If your dog has an ear infection, the vet may instruct you to actually squirt the cleaning solution directly into the ear itself, instead of on a cotton ball or gauze pad. 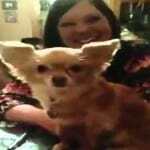 Here’s a short video that will walk you through how to clean your dog’s ears. Some dogs are sensitive about having their ears cleaned or even touched. I love this video from a dog trainer where he shows you how to teach your dog to accept ear cleanings without a hassle. I have heard great things about the products he mentions in the video. You can get them here. Or you can order them on Amazon through my affiliate link here. 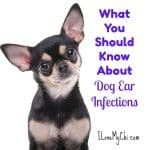 So now that you know how to clean out your dog’s ears, be sure to read about dog ear infections here. 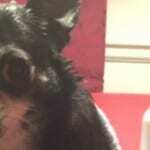 So do you regularly clean your dog’s ears? If not, do you think you will give a try now? Are they Ears or Wings? It amazes me how much I don’t know about sharing my life with a cat or dog. There’s always something more to learn. I never knew cleaning a dog’s ears was a thing … but as I’ve learned with Bear (and having to brush his teeth daily to avoid losing more teeth than he already has just due to genetics) – prevention or mediation is way better than having to treat something. Thank you for linking up to the Showcase. Thank you for a very comprehensive post on cleaning ears. When we deal with our own we are weary, but I think when its with others, or our pets it can be easy to over or under do it. I would not have thought before, that this needs to be considered, but now I know I will be on the lookout for it and act accordingly. As Momma Kat said, prevention is better than cure. Yes, prevention is better than cure. Thanks for dropping by Erin. Great tips and information! So many dog owners struggle with ears! I have always had dogs with drop ears so ear infections are nothing new to me. I used to only use Epi-Otic to clean them, but now I use Liquid Health K9 Ear Solution and I love it. That said, one thing to possibly add to your follow up post is the cause of ear infections. We found that one of our mastiffs was allergic to chicken. He had constant ear infections for about 6 months. Once I eliminated chicken, he hasn’t had an infection since. Thanks for the suggestion Stephanie. Yes, ear infections are often brought on by allergies. How did you find out that chicken was the culprit? Chicken would be one thing I would never have thought of as being an allergen. We’ve dealt with ear infections, and even hematomas with past dogs, so I try to be diligent about cleaning ears every 2-3 weeks. You have some great tips here, such as I didn’t know you could just use white vinegar and water. We like to do things naturally here, so I like that idea! Thanks Jan! My vet suggested the vinegar and I was really impressed that he suggested a natural alternative that actually worked better than the stuff I bought from him. Thanks for sharing this, and for joining the showcase. With labs and their long ears, keeping them clean is important. I use a solution that is supposed to be squirted in the ears, massaged and then shaken out, much like the man in the video showed. Neither one of my dogs care for it, although they both like their ears rubbed. I had no idea about the vinegar, so when this stuff is done, I plan on switching to that. Like Jan, I like to be as natural as I can be. Let us know how the vinegar works out for you Jodi. Thanks for stopping by! Owning a pair of standard poodles I am all too familiar with ears and the ‘impawtance’ of keeping them clean. They also need to be plucked for healthfulness, something no standard poodle enjoys. Recently having found ear powder which absorbs any liquid from baths and making the plucking so much easier has been such a godsend and much easier on the fur-kids. Thanks for sharing the video. All dog owners need to know this skill, much like dental care. Their pets will thank them (but only after it’s done 😇). Yes, poodles definitely need their ear hair plucked although most other breeds don’t have it in their ears. Professional groomers have always used ear powder that somehow loosens the hair and makes it much easier to pull out. I’m glad you found out about it. Your poodle is beautiful! I have a soft spot for poodles as we always had them growing up.